Warren Smith and Partners have been awarded the Hydraulic and Fire Services consultancy role by Lendlease for Two MQ, the second stage of Melbourne Quarter. We are pleased to continue the long relationship enjoyed between ourselves and Lendlease on this Melbourne based project. Two MQ is a 29 level commercial tower above ground, which includes 4 levels of basements and retail, main lobby level, 2 levels of plant space and 23 levels of commercial space. There is also Melbourne Square, a significant area of public domain over Werundjeri Way fronting onto Collins Street that we will be involved in designing. 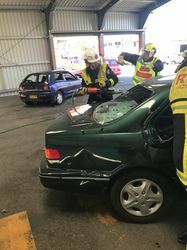 Last Wednesday 29 April 2017, some of the members of our Hydraulic and Fire services teams attended the Fire & Rescue NSW State Training College at Alexandria. Team members included Jonathan, John, Daniel, Tom, Chris, Chinmay, Mark, Ralph, Manu, Oscar and Roman. The guys were taken through a hands on approach into what fire fighters have to deal with when attending an emergency, in the vision that when designing fire systems we may have a better understanding of how their operations are carried out. It was a great afternoon and we’d like to thank FRNSW for the opportunity. Warren Smith and Partners were extremely proud to receive the 2016 Australian Institute of Landscape Architects ‘Landscape Architecture Award’ for our involvement in the Barangaroo Reserve project in the ‘Parks and Open Space’ category. Our client was Barangaroo Delivery Authority. Warren Smith and Partners were proud to be recognised by Engineers Australia as finalists for the Australian Engineering Excellence Award 2011 for our work on Kings Avenue Overpass. Warren Smith and Partners collaborated with National Capital Authority, Johnson Pilton Walker, Taylor Thomson Whitting, Steensen Varming, SMEC and Woden Contractors for this project. Sitting with equal points on the ladder and only a handful of goals to separate each team it was a crucial fixture for both sides going into the game. The tension was palpable and Yahoo7 were the first to feel the keen sting of that pressure early on in the piece when they were a touch unlucky in putting the ball into their own net off a well-hit cross from John Chaumont. Rattled from the own goal the opposition defence were again caught off-guard when Jonathan Mousdell charged into the box. Using some clever footwork and a strong boot he found the back of the net to put the Water Wizards two up. It seemed the win was inevitable as the Yahoo7 goal posts were continually rocked and the keeper tested by Laura Shaugnessy who never let them take a breath all game. Yahoo7 certainly knew it was all or nothing and even brought the keeper out of goals to assist in the field. The tactic paid off. Even with some strong keeping from Michael Cahalane to knock away at least a dozen shots Yahoo7 were able to equalise before the break. With the second half underway it was clear that if there was going to be a winner to this game something extra would be required. It would be the Water Wizards to produce the special moment when Chris Augostin, although surrounded by opposition players, managed to pull off a brilliant penetrating pass that found Nicole in space and one-on-one with the keeper. With a cool head Nicole slotted the ball past the keeper to once again put the Water Wizards ahead. The game was not without some controversy. Jonathon decided to employ a few extra limbs and was pulled up for handball. A second handball would earn him a red card and an early trip to the showers. Down a player for the final minutes of the game the Water Wizards kept pushing and were able to hold out for the victory. This week’s fixture presents the Water Wizards with a chance to close the gap on second placed LEAPsters. After last week’s win the Water Wizards are now only six points away out of first place and with the top spot in their sights will be working even harder to improve their title chances. The Hydraulics drafting team went Tenpin bowling on November 16, 2016, and we can say that bowling was definitely the winner on the day. From all accounts everyone enjoyed themselves. Secrets & pins were spilled. One secret that can be divulged here is Rocky was in a under 5 semi-professional left handed amateur one-pin bowling league in China. But was disqualified for being found to be 23 at the time and right handed. Rocky’s experience in the one pin league put him good stead in the early frames, however when everyone had warmed up, pure luck took over from Rocky’s experience and all scores were level half way going through the first game. The quiet achievers Jane and Sonia slowly built momentum to be in the race, however equipment failure prevented them from coming home strong. In investigations after the games it was discovered that Jane and Sonia’s bowling balls were not Internationally Sanctioned bowling balls and were incorrectly weighted which forced them into the gutters. Scott came out of the gates early with blinding bowling, but the pace could not be sustained and he suffered a minor gluteus maximus strain. Roman was the dark horse, slowly building momentum to be close at the end of the first game. However when all the pins were cleared, dust settled and fashionable kicks were returned to their rightful place the clear winner was Tristan, who bowled the perfect game. No one can exactly remember the score but word on the street is it was close to 600. Good fun was had by all, due to the credo that what “goes on at tenpin stays at tenpin” the photos below have been altered to protect the guilty. In unfortunate news Rocky has been officially fired as team photographer. Game seven for the Water Wizards started unexpectedly with a forfeit from the opposing team. Although this automatically means we get the win (woohoo), The Wizards were disappointed about not being able to play an actual game. Luckily the Division 2 team which played in the time slot just before us, the Bueno B Wizards, agreed to play against us in a friendly match. From the get go, this Wizard vs. Wizard game definitely had a more magically competitive edge than a friendly one. The game started strong with some great defending from both teams and a lot of back and forth possession of the ball. The Water Wizards struck early to bring the score up to 1-0 but were quickly dominated by the Bueno B Wizards as they scored 2 goals in quick succession. Nonetheless there were a plethora of shots had by both teams and some excellent team saves, keeping the game very exciting. Unfortunately, this game saw more injuries sustained than usual. In an attempt to clear the ball from our goal post, Nick managed the lob the ball straight into the only B Wizards player wearing glasses, sending him off the field temporarily. At some point, Laura also ran full force and head on into the female B Wizard goal keeper ramming them both into the wall. Although no-one was keeping strict time, at some halfway point the score was 4-2 to the Water Wizards, with goals scored by Nicole, Laura and Jonny. The “second half” saw the addition of our usual ref and another member of the KGV staff as players in the game. With these two additions, the standard of playing skill increased greatly. We were able to see some very fancy footwork from both the ref and his colleague. Both Grahame and John had their turn as keeper and managed to keep most of the shots out of goal with some nail biting near misses. However, the injuries kept up as the aforementioned B Wizards player was struck in the face by the ball yet again by John this time. Nicole managed to score another goal, but at the expense of the female keeper (again), who was left with a battered knee and winded as Nicole and a B Wizards player simultaneously tackled the ball at her feet. The Water Wizards had some excellent defending by all players in the team which allowed us to pull off a final 7-4 win. It was a fun, although injury prone, game and the Water Wizards were very appreciative to even have a game at all. Game 5 for the Water Wizards saw 7 of our players enter the pitch for what was to be a stinking hot and extremely sweaty 26 minute game. The first half saw some quite even possession between both teams putting the pressure on to score goals and come out on top. New comers to the team, Alison and Graham, proved to be invaluable with Alison seemingly always open and in the right position and Graham acting as a defending powerhouse not to be messed with. Two goals were scored in quick succession by Nick in the first half giving us a fantastic boost to start. Excellent keeping by John meant that minimal goals were scored against us and we remained up in the first half with a score of 3-2. The second half proved more challenging as the heat really started to exhaust everyone. But with some fancy footwork from Manu and set ups by Rocky, John managed to score 2 more goals! All this resulting in a win with final score of 5-4.